The mystery over Black Panther‘s ditched lesbian scene has deepened. Ryan Coogler’s acclaimed Marvel comic adaptation was a hit at the box office, but it has also come in for criticism from fans over its treatment of character Okoye, played by Danai Gurira. 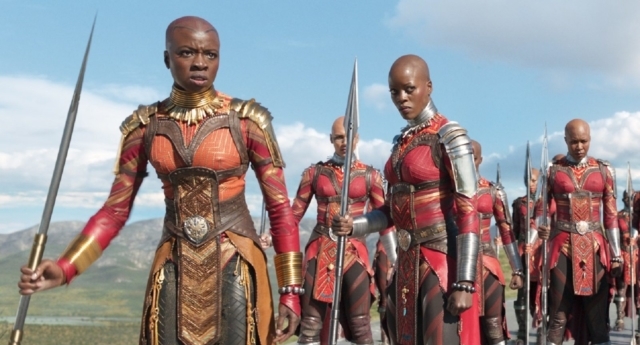 Fans had hoped that the film would adapt a storyline from comic series World of Wakanda, which saw two of the all-female royal guard in a lesbian relationship. Ahead of the film’s release rumours began to fly about a scene referencing the storyline, showing Okoye flirting with fellow warrior guard Ayo (Florence Kasumba). However, the scene was absent from the final release, with Kasumba confirming the idea had been ditched during production. The mystery deepened when a separate deleted scene was released this week – revealing that Okoye is married to a man. The scene shows Okoye and W’Kabi (Daniel Kaluuya) having a dispute about their conflicting loyalties. Speaking on USA Today, Coogler said: “Making the scene was the intention for the audience to really realise that Okoye and W’Kabi were husband and wife. It is unclear whether the two scenes existed at the same time during production, or whether they were separate ideas explored at different points in production and both ditched. Kasumba, who plays Ayo, previously confirmed to Vulture that a scene referencing her character’s sexuality had been abandoned. She said: “The thing is, if the makers would have wanted everyone to see the scene, it would have been in the movie. “The final result that we’ve seen, there were a few scenes that have been cut. Different scenes, also. The film’s co-writer Joe Robert Cole added fuel to the fire. Asked if there were original plans to adopt the queer World of Wakanda romance, he told Screen Crush: “I think the short answer is yes. I know that there were quite a few conversations around different things, different directions with different characters, and characters that we may have. Marvel – and Disney, the corporation which owns Marvel – has attracted criticism for its extreme reluctance to include LGBT people in its films. A scene in Thor: Ragnarok confirming that superhero Valkyrie was bisexual was shot, but mysteriously edited out. And Star Wars execs are more than happy to encourage queer fans’ speculation about a romance between fan favourites Finn and Poe – while they rush to introduce heterosexual love interests. This is despite the Disney Channel featuring multiple LGBT characters, including the groundbreaking Cyrus Goodman on Andi Mack. Marvel’s Runaways has a lesbian superhero, in the shape of Karolina Dean, a main character who slowly realises her sexuality while also figuring out her powers. Marvel also launched a comic last year led by America Chavez, a queer Latina teenager with lesbian parents. And Black Lightning, on Netflix and The CW, has Anissa Pierce, a black lesbian medical student, teacher and – as it turns out – superhero by the name of Thunder. Other film companies have not be as hesitant to include prominent LGBT characters. Shatterstar, a bisexual, polyamorous superhero who has appeared in comics since 1991, will star alongside Ryan Reynolds’ pansexual Deadpool in the sequel to 20th Century Fox’s 2016 smash hit.